Turkey’s exports in March total $13.6 billion, an increase of 19 percent year-on-year. Turkey’s exports have increased for a third straight month in March, data from the Exporters’ Assembly of Turkey (TIM) revealed on Saturday. Turkish exports in March have increased 19 percent year-on-year, the highest rise since November 2012, according to TIM. Exports totaled $13.6 billion last month and reached $37 billion for the first three months up from $34.7 billion in 2016, which represents an increase of 6.7 percent compared with the same period last year, TIM announced. Turkey’s total exports within the last 12 months stood at $144.9, up by 2.4 percent compared with the previous 12 months. “With the recovering global economy and the support and incentives of our government, Turkey’s exports started to rise again in 2017,” said TIM President Mehmet Buyukeksi. Strong growth in exports will impact Turkish economy’s growth rate positively, Buyukeksi added. The largest volume of exports in March was made by the country’s automotive industry again with $2.7 billion, followed by the ready-made clothing sector with $1.53 billion and the chemical materials and products sector with $1.5 billion, according to the data released. 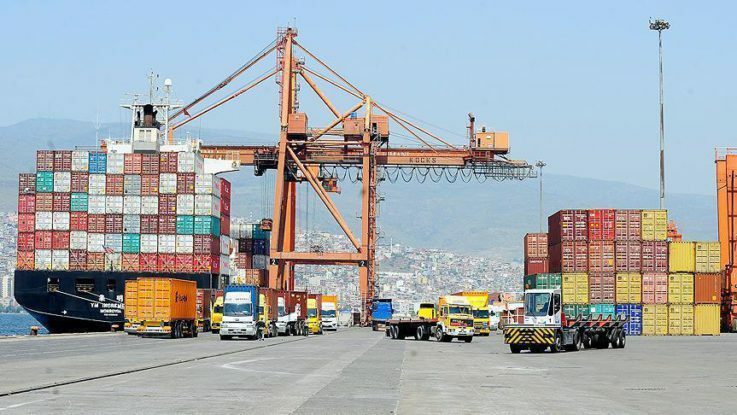 Exports to Asia increased by 44 percent and to the European Union by 20 percent, while Turkey’s exports to Holland decreased by 8.5 percent in March year-on-year. Improving relations with Russia also resulted in increased exports to Moscow by 45.3 percent in March and by 40.3 percent in the first three months. However, the country’s exports to Iran decreased by 17.1 percent, and those to Egypt by 13.3 percent, according to TIM’s data. The largest increase in the country’s exports among the top 30 markets was seen in Malta and Portugal with 95.9 percent and 92.1 percent respectively. The exports to Singapore increased by 340.5 percent and to China by 73 percent in March. Commenting on Turkey’s growth rate in last quarter of 2016, TIM president said that the rate was below the country’s potential. “But the growth rate came better than expected. The growth reinforced that macro fundamentals of the Turkish economy is strong. We continue to grow despite the failed coup attempt, terrorist incidents, and rating cuts by the international agencies. We believe that we will achieve much higher growth figures this year with incentive packages given by our government,” he added. On Friday, the Turkish Statistical Institute said that Turkey’s economy expanded at the rate of 2.9 percent in 2016. The country’s fourth-quarter GDP reading was also substantially higher than the experts’ median estimates, coming in at 3.5 percent compared with the 2.4 percent Anadolu Agency’s survey prediction.